Asgard has developed a purpose built unit, which has been matched in colour and size to harmonise with your caravan. It is waterproof, fire resistant and carries a ten year anti-perforation guarantee making the Asgard Addition the perfect match. A first class product. The erection service was polite and highly efficient. I bought this to store my bikes in. I must say, absolutely perfect for the job! The units have double doors, which can be positioned either on the left-hand side or right-hand side of the unit. 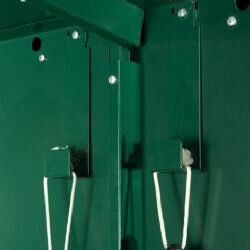 They bolt to the ground outside your caravan and up to 2 units can sit conveniently under caravan windows. The Addition unit is available in a choice of 3 colours as standard; either ivory, dark green or dark brown. Where security is not a major concern, the Addition provides extra storage space for equipment such as garden furniture, tools and awnings, which cannot be conveniently stored inside. 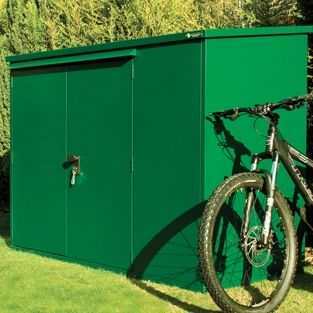 Although originally designed for use with static caravans, there's nothing to stop you from using the Addition as a general garage or garden store. 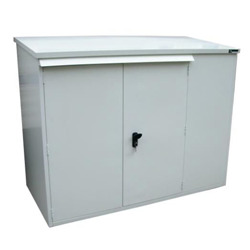 The height of the units means it can sit conveniently by the side of a fence or wall or beneath house windows.